Graphic illustrated a glimpse of his star potential after running a super race which saw him record fourth place in the Group 1 Zabeel Classic over 2000m at Ellerslie last week. Ridden by regular rider Craig Grylls, Graphic settled nicely at the tail end of field throughout before making his move hard up against the rail on the turn for home. Half way down the straight he looked a winning chance, before being out finished by some of his more seasoned counterparts over the final stages of the race. “It was a great effort in such a strong field,” said co-trainer Chad Ormsby. Graphic will have one more run, at Ellerslie on January 10, before defending his title in the Group 2 Wellington Cup over 2400m later in the month. Stablemates, Unknown Pleasures and Spitfire Lady, also produced pleasing runs, while Spitfire Lady added further black-type to her illustrious pedigree when running third in the Listed Newmarket Handicap. “She was always going to improve after her first up run and at her best she should be winning races of that stature,” Ormsby said. Jockey Alysha Collett gave her a lovely run in behind the leaders and she showed a strong sprint over the final stages of the race. Unknown Pleasures was a gallant fifth in what was a strong field of gallopers, and she will take huge improvement from the run after having a considerable amount of time off on the sidelines. 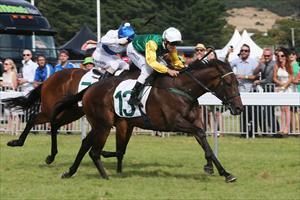 “We think a bit of this mare and we won’t see the best of her until we get to 1600m and over,” said Ormsby.